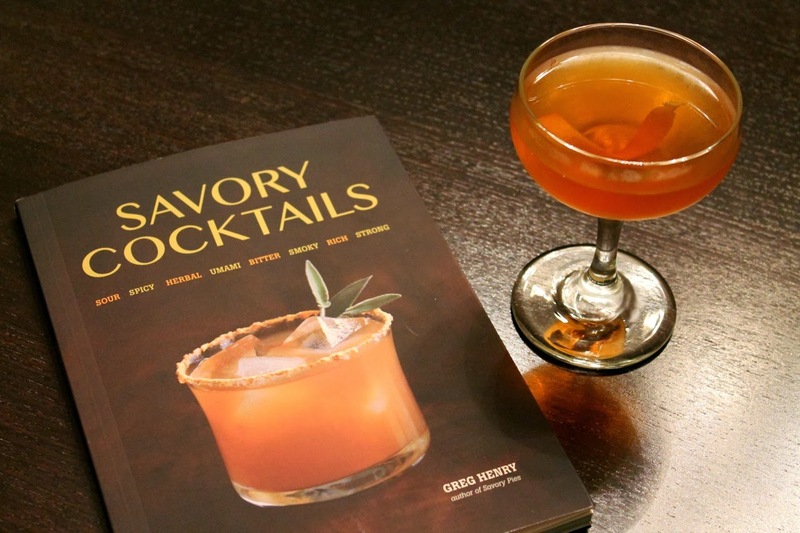 Greg Henry's Savory Cocktails is quickly becoming one of my favorite go-to cocktail books. I read about this book last year and put it on my wishlist. Then I got really lucky and won it in a giveaway from Vanilla Sugar Blog late last year. Excellent! While many cocktail books are organized around spirits, or just present their drinks alphabetically, Savory Cocktails is organized by flavor profile: sour, spicy, herbal, bitter, smoky, umami, rich and strong. Notice there's no "sweet," since Henry's aim is to highlight cocktails with more savory profiles. 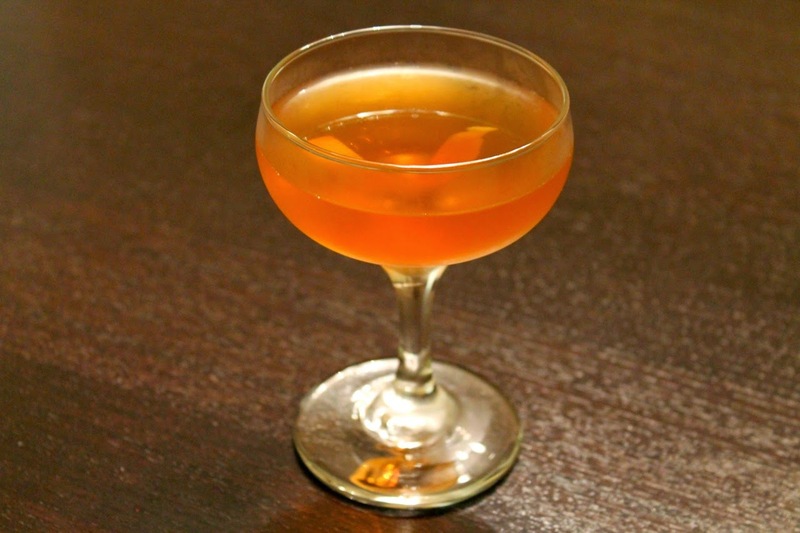 Sweet is basically default with cocktails anyway: almost all cocktails have something sweet in them, such as liqueur, syrup, sugar or sweet wine. 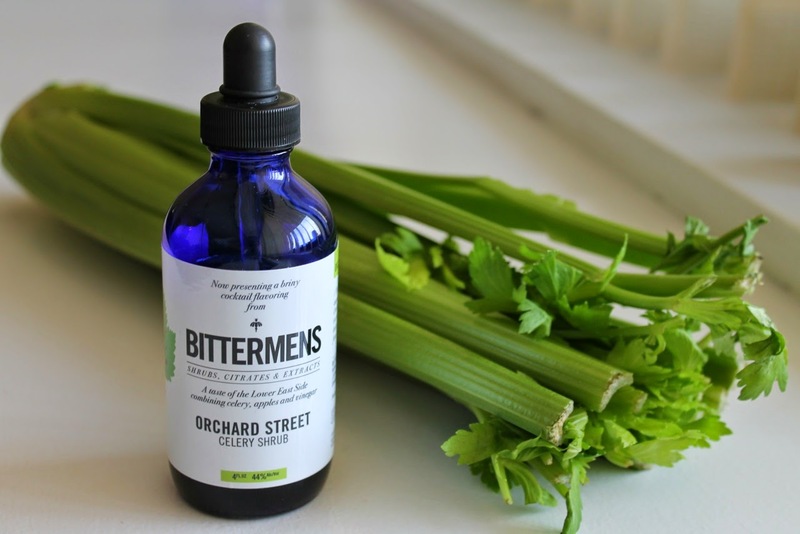 Henry's a big fan of Bittermens Orchard Street celery shrub. Sort of like bitters, shrubs are old-fashioned "drinking vinegars" that were popular in colonial times and have made a comeback recently thanks to the cocktail renaissance. Bittermens designed their celery shrub as an homage to the 1930s era celery soda, Dr. Brown's Cel-Rey Soda. Because of its popularity during the tenement era, they named the concoction Orchard Street, which is where the Lower East Side Tenement Museum is located. Henry developed the perfect showcase for the shrub with his Celery Shrub Cocktail, a mix of Scandinavian aquavit, which Bittermens recommends with its celery shrub, an Italian amaro and celery shrub. The cocktail's pronounced bitterness is offset with just enough sweetness to make it an enjoyable, refreshing cocktail that feels just right for spring. Savory Cocktails also includes Bittermens' recipe for the Scandi Gibson, a spicy-savory take on the classic gin cocktail reimagined with aquavit, Cocchi Americano, celery shrub and Bittermens' other shrub product, Hellfire habanero shrub, a personal favorite I've used in the Margarita on Fire, Smokin' Hot Tomato, Breaking Bad's The Heisenberg and three Dallas Drinks: The Drew, The Emma and The Nicolas. Combine aquavit, amaro and shrub in a cocktail mixing glass half-filled with ice. Stir until chilled and diluted, about 20 seconds. Strain into a chilled coupe or cocktail glass and garnish with lemon twist. Combine aquavit, Cocchi Americano, habanero shrub and celery shrub in a cocktail mixing glass half-filled with ice. Stir until chilled and diluted, about 20 seconds. Strain into a chilled rocks glass or coupe and garnish with cocktail onion. *Note: lacking cocktail onions, I tried making this instead by muddling the green part of a scallion in the cocktail mixing glass. This imparted just a hint of onion-y flavor that actually worked rather well. Mr. Henry is changing the way we enjoy cocktails in our home. Cheers to him and his terrific book.